DHCP stands for Dynamic Host Configuration Protocol, and is commonly used to configure network devices so they can communicate with one another. Typically you’ll have a DHCP server (like a wireless router), and client machines on the local network (like a Mac, iPhone, PC, etc) that pull a dynamically assigned local IP address from that server. This is all well and good and usually functions just fine, but sometimes you need to renew a DHCP lease, which basically means you’ll be retrieving a new IP address and routing data from the DHCP server. This is a common trick for troubleshooting network issues, and can be helpful when resolving problems with internet connectivity when a wi-fi connection has been determined to be stable, or when a machine on the network can’t access the outside world after power-cycling a broadband modem or router. Often renewing a DHCP lease means the Mac will end up with a different local IP address than it had before, though sometimes you will end up with the same one. If the reason you are renewing DHCP is to try and get a new IP address but the router continues to stubbornly assign the same LAN IP over and over again, consider setting a static IP instead by configuring DHCP with manual addresses. Another approach, though more advanced, is to renew DHCP by way of the command line. This is typically best used by advanced users, but it can also be helpful for remote troubleshooting if you can only SSH into a remote Mac and something like Screen Sharing is not available to you. The other obvious advantage with a command line approach is possibility of using the lease renewal in a script or as part of an automated task within cron. If running that command returns nothing, then you are looking at the wrong interface. 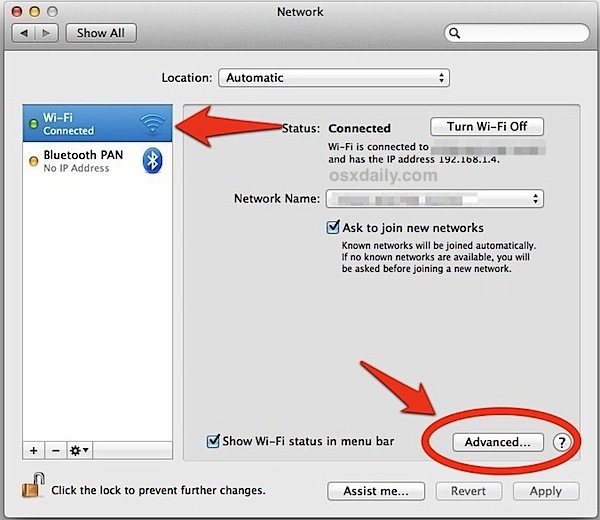 Typically en0 is the default wi-fi interface on MacBook Air and newer MacBook Pro models, but it is often en1 on Macs with physical ethernet ports. Again, be sure to use the appropriate network interface for your hardware: en1 or en0. Each method outlined here will work in virtually every version of Mac OS X, from the old versions to the new. 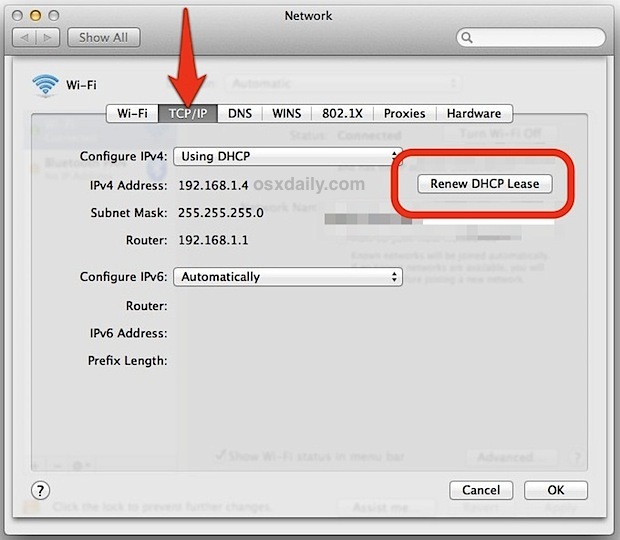 Finally, if you’re troubleshooting network wide issues on all devices on a LAN, you can also renew a DHCP lease from iOS and get new local IP addresses on iPhones, iPods, and iPads. My Wi-Fi is not connected. I am using Ethernet. I am using Air Port Extreme. Why can I not connect Wi-Fi?